The Arch of Constantine was completed in 315 to commemorate the victory of Constantine at the Milvian Bridge in 312. However, most of the sculpture was reused from earlier monuments and it has also been suggested that the arch was merely reworked. It is also possible that it was originally commissioned by Constantine's rival Maxentius. The sculpture from Constantine's time include the frieze above the lateral arches and the column base and spandrel reliefs. The head of the emperor in the round reliefs originally depicted Hadrian but was reworked to resemble Constantine. 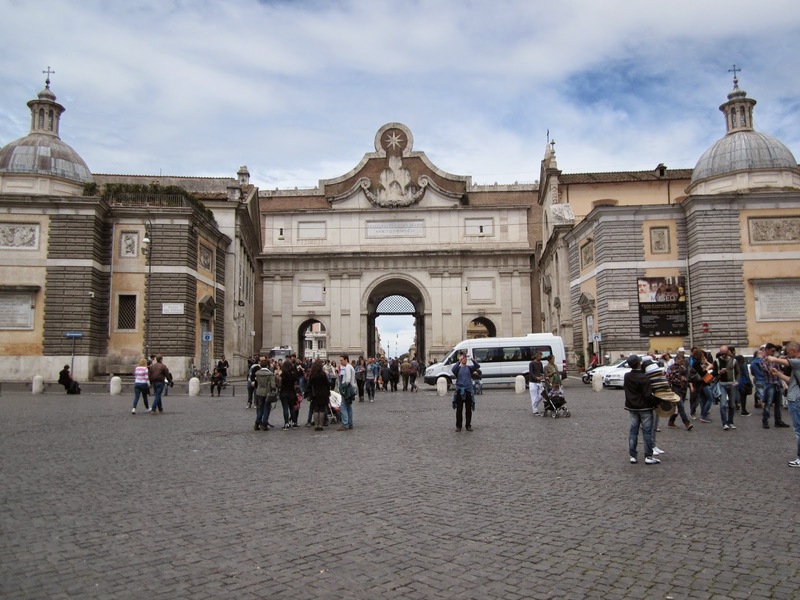 The arch is similar in style to the Arch of Septimius Severus, which was built over 100 years earlier. The Temple of Saturn was rebuilt between 360 and 380AD after a fire destroyed the previous building from 42BC. Most of the building material was reused from the previous temple or from other buildings. One of the few new architectural details were the Ionic capitals, which were carved in white marble for the rebuilding. Several of the columns were made by fixing together various broken pieces, which can still be seen in the bracing around the shafts. The original temple may have been built as early as 497BC. Originally built as a mausoleum to Emperor Hadrian in the second century AD, the structure may have been fortified as early as the fourth century. The name Castel Sant Angelo refers to a vision by Pope Gregory the Great, which was associated with the end of the plague in 509. The 18th-century bronze statue of Archangel Micheal is a reference to this vision. The bridge was originally built during the same period as the mausoleum. The statues were designed by Gian Lorenzo Bernini in the 17th century. The Church of San Basilio al foro di Augusto was originally built in the 9th century as a small oratory, making use of the existing apse of the temple of Mars Ultor and the wall of the Augustan forum. The ancient structures had probably been left as ruins after an earthquake in the fifth century. The church was rebuilt and dedicated to St John by the Knights Hospitaller in the 13th century and rebuilt again for Dominican nuns in the 16th century and renamed Santissima Annunziata. The church was demolished in 1932 to make way for the Via dei Fori Imperiali, leaving only the entrance and windows that had been pierced through the forum wall. Palazzo della Cancelleria was built for Cardinal Raffaele Riario and was supposedly financed with winnings from one night of card games. Construction began in 1487-88 and was completed in 1513. Records were presumably lost in the sack of Rome in 1527 and the architect is unknown. Several names have been suggested, including Francesco di Giorgio Martini, Baccio Pontelli, Andrea Bregno and Donato Bramante, and several were probably involved due to the long period of construction. The fifth century church of San Lorenzo in Damaso was incorporated within the palatial facade, while the entrance portal was added in the 16th century by Domenico Fontana. 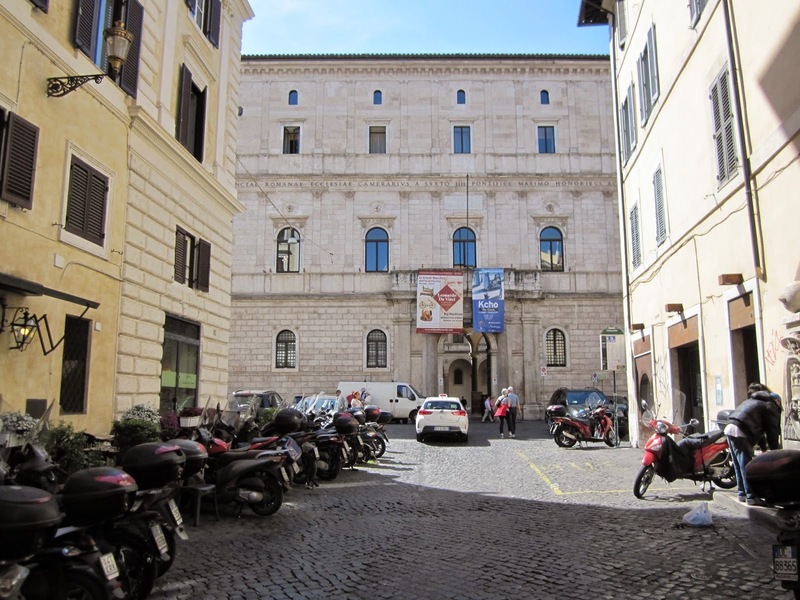 It became the seat of the Apostolic Chancery in 1517 when Riario was forced to relinquish the palace to the papacy in the face of charges of conspiracy to murder the pope. The travertine stone used in the facade is said to have been taken from the ruins of the Theatre of Pompey. Bramante is unlikely to have been involved in the design of the facade of the Cancelleria, as he is not thought to have arrived in Rome before 1499. However, he may have had a hand in the design of the courtyard. The Egyptian granite columns were originally built for the Theatre of Pompey but had already been reused for San Lorenzo in Damaso. 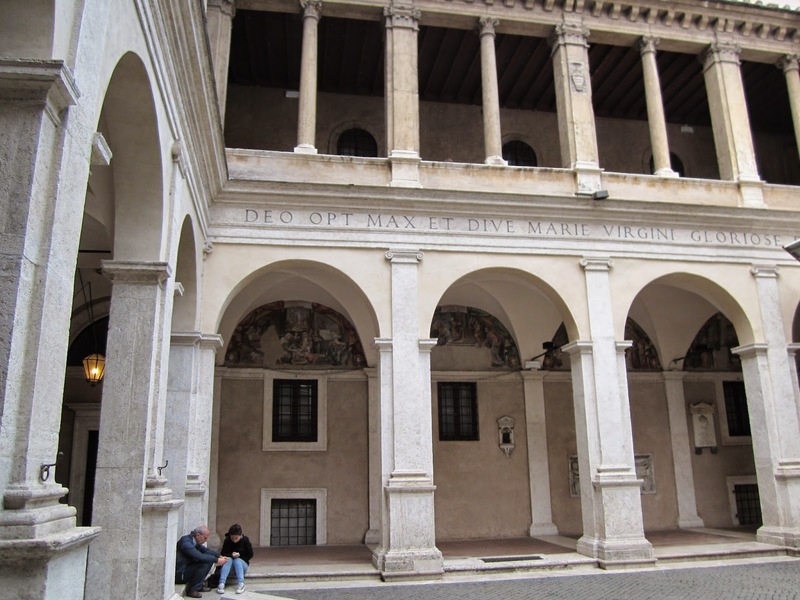 The Bramante cloister besides the church of Santa Maria della Pace was built in 1500-04. It was Bramante's first recorded work in Rome, on commission from cardinal Oliviero Carafa. The church was built on the site of a previous church called Sant'Andrea de Aquarizariis in 1482. The architect is unknown but was possibly Baccio Pontelli. Other suggestions include Meo del Caprino, Francesco di Giorgio Martini and Leon Battista Alberti. The dome was probably designed by Antonio Sangallo the younger and built in 1525. The church was almost completely redesigned and given a new facade in 1656-67 by Pietro da Cortona. 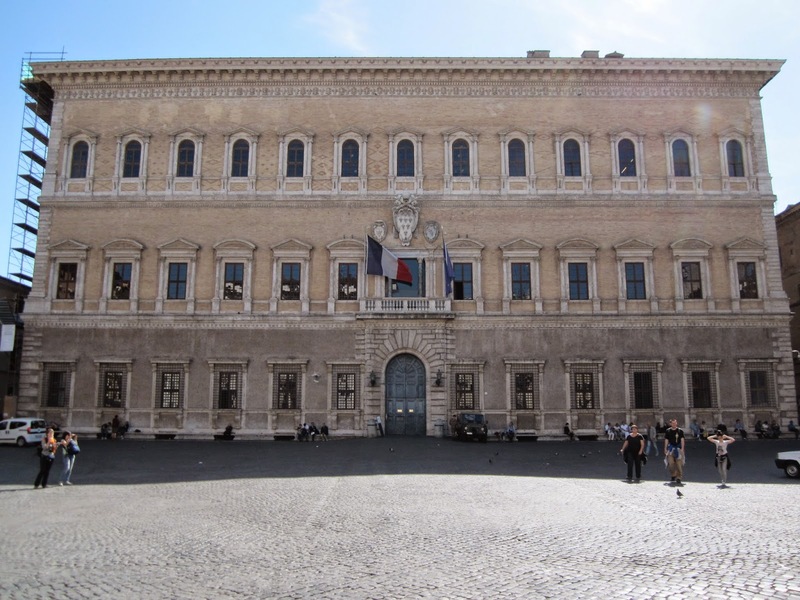 Construction of Palazzo Farnese began in 1515 to a design by the architect Antonio da Sangallo the younger. Work was stopped by the sack of Rome in 1527 but expanded significantly after 1534 when cardinal Alessandro Farnese was elected pope. Michelangelo modified the original design with a less orthodox treatment of the top storey. Michelangelo also proposed to link the palace with a bridge across the Tiber to the Villa Farnesina. Work was continued by Jacopo da Vignola and completed by Giacomo della Porta in 1589. Palazzo Senatorio was originally built in the 13th century but the facade was entirely rebuilt according to a design by Michelangelo made in the 1530s. The work was carried out after his death by Giacomo della Porta and Girolamo Rainaldi in 1578-82. At the same time, a new bell tower was designed by Martino Longhi the Elder after the previous medieval tower had been struck by lightening. The pre-renaissance facade included a multi-storey loggia but this was later walled in to strengthen the building, while towers were added in the late middle ages and early renaissance. 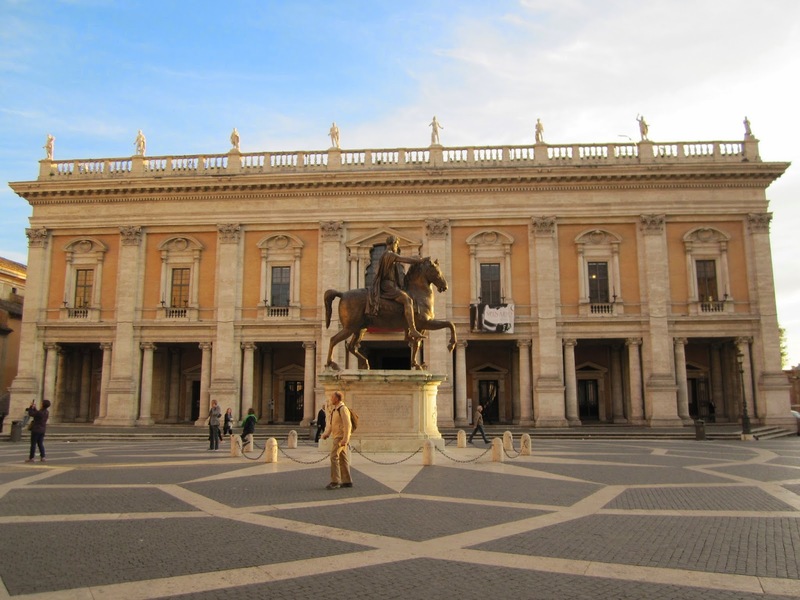 The equestrian statue of Marcus Aurelius was moved from the Lateran to its present position in 1538. 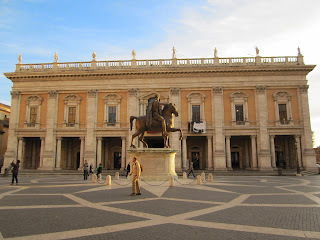 The current statue is a replica and the original is kept inside the Capitoline museum. The Lateran Palace as it now appears was built in 1586-89 to a design by Domenico Fontana for Pope Sixtus V. The design was continued when the palace was extended in 1735 under Pope Clement XII. The original palace existed in Roman times and was gifted by Emperor Constantine to the bishop of Rome in the early 4th century. The palace remained the principal seat of the popes for the next 1000 years and was extended in the 8th century, rebuilt after a fire in the 10th century and embellished under pope Innocent III in the 12th century. The place suffered two great fires in the 14th century and the popes eventually moved to the Vatican at the end of the Avignon papacy and the schism. The obelisk is the largest standing Egyptian obelisk in the world and was erected at its site in 1588, 50 years after the statue of Marcus Aurelius had been relocated to the Capitol hill. 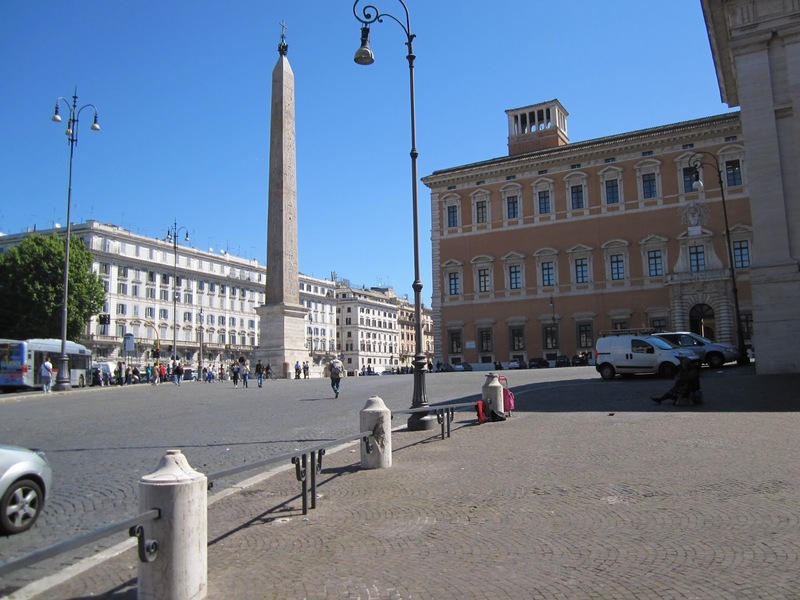 The obelisk was originally brought to Rome in the 4th century and placed at the Circus Maximus. Construction of the church of Santa Maria di Loreto al Foro Traiano was originally begun in 1507, but the dome was only finished by architect Jacopo del Duca in 1596. The adjacent church of Santissimo Nome di Maria al Foro Traiano was built in 1736-41 by French architect Antoine Derizet. It replaced an older church that was demolished in 1748. 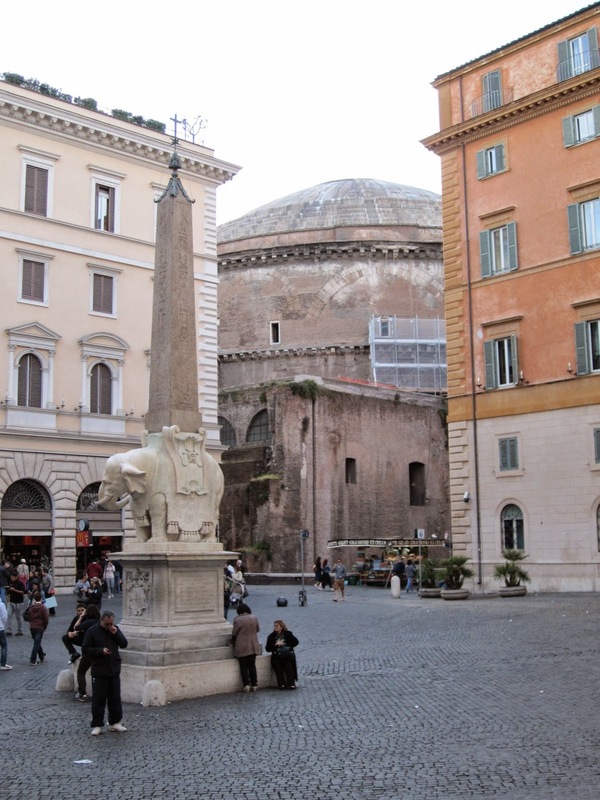 The churches stand opposite Trajan's column, completed in 113. Santa Maria in Vallicella, also known as Chiesa Nuova, was built in 1575-1606 as the principal church of the Oratorians. The initial architect was Matteo di Citta di Castello, followed by Martino Longhi the Elder. The facade modelled on the Gesu was designed by Fausto Rughesi. The buildings opposite the church were pulled down in the 1880s to create a new thoroughfare. 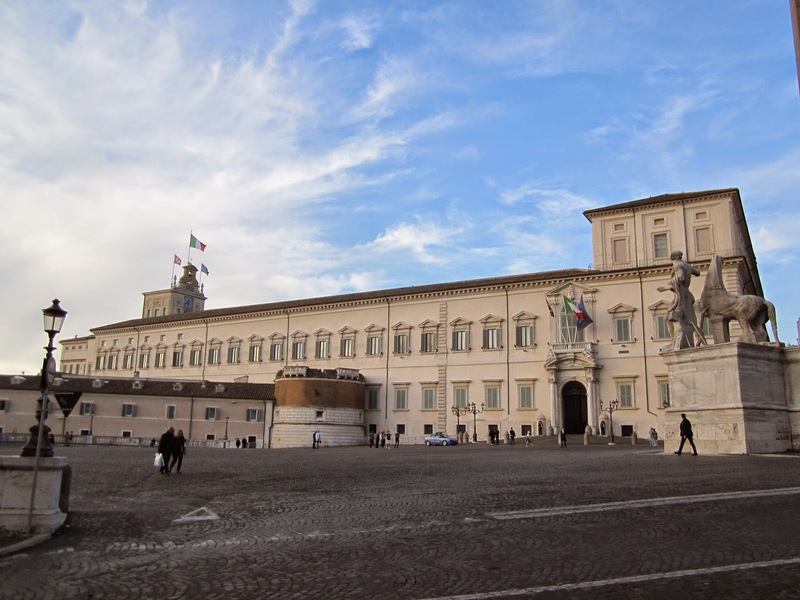 Palazzo del Quirinale began as a summer retreat built for pope Gregory XIII and was completed in 1585 to a design by architect Ottaviano Mascarino. The pope's death in the same year prevented the second building phase, which was intended to enlarge the structure into a great palace. However, work resumed under the next pope, Sixtus V, who hired the architect Domenico Fontana. The palace was completed under pope Paul V, initially by the hand of the architect Flaminio Ponzi and after his death by the architect Carlo Maderno. Further works were completed by Bernini in 1657-59, Alessandro Specchi in 1722-24 and Ferdinando Fuga in 1730-32. 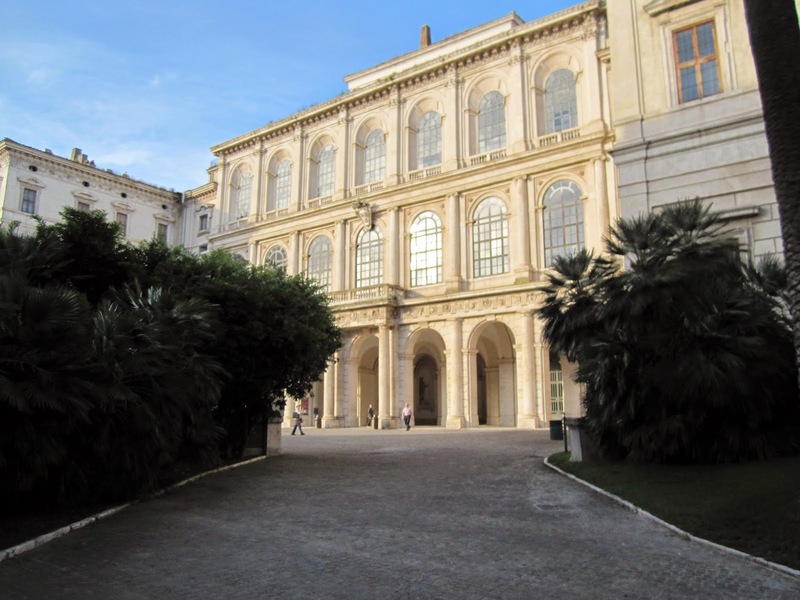 Palazzo Barberini was built in 1627-33, initially to a design by the architect Carlo Maderno, who was tasked with enlarging a pre-existing building from 1549 known as Palazzo Sforza. When Maderno died in 1629, the project was taken over by Bernini. Maderno had been assisted by his nephew Francesco Borromini who continued to work on the project under Bernini's supervision. Some key features of the design such as the false-perspective windows are attributed to Borromini. 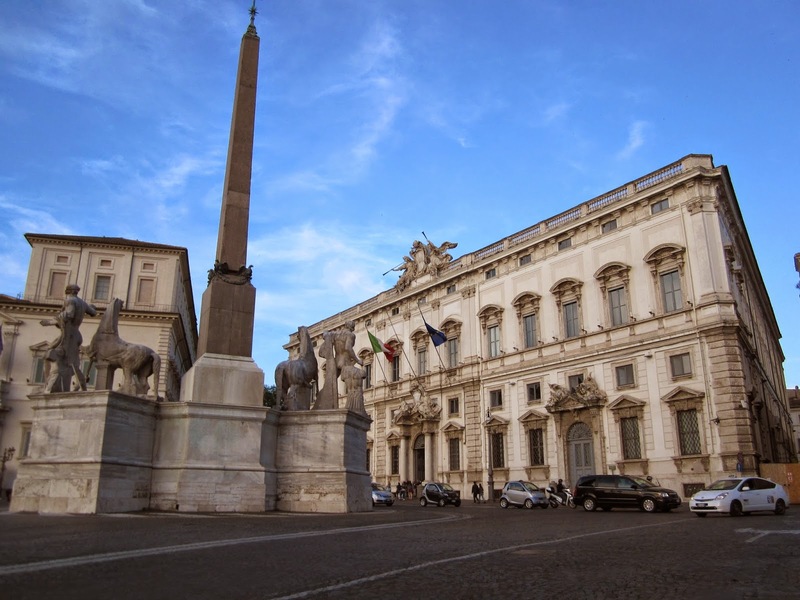 Palazzo Montecitorio was originally designed by Bernini during the reign of pope Gregory XV as a residence for the Ludovisi family. Work was interrupted when the pope died in 1623 and was only resumed when Innocent X became pope in 1644. Carlo Maderno modified Bernini's design and added the bell gable. An excavated obelisk was installed in front of the palace in 1789. 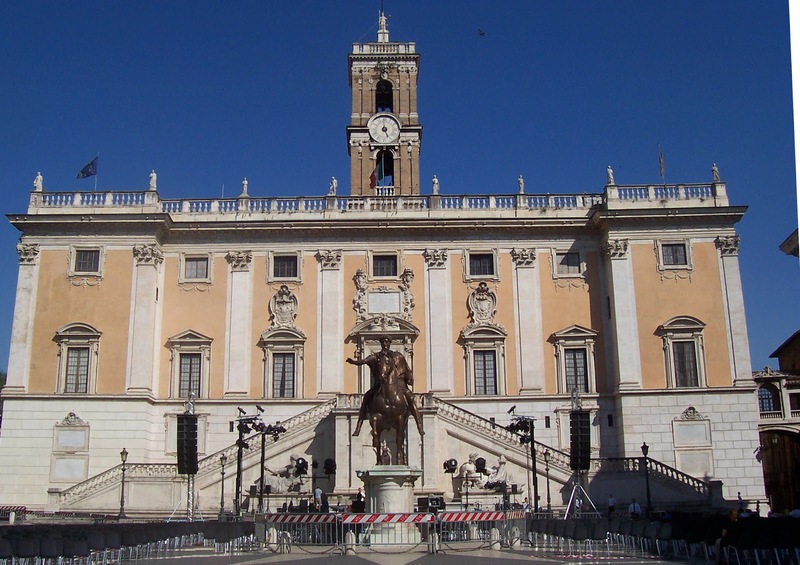 The building had been designated for public functions upon its completion in the mid 17th-century and was selected as the seat of the Chamber of Deputies of the Italian parliament after 1870. The building was entirely rebuilt internally in 1900-1910 to designs by architect Ernesto Basile and a new section was built at the rear. The current baroque facade of Palazzo Madama is from the 1650s to a design by Cigolo and Paolo Maruccelli. The building was originally commissioned in the late 15the century by the Medici family and was completed in 1505. It was built on top of the ancient ruins of the baths of Nero. 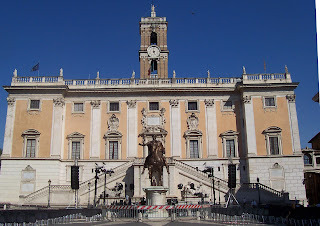 The building has been in use by the Italian senate since 1871. In 1665, an Egyptian obelisk was discovered in the garden of the Dominican cloister of Santa Maria sopra Minerva. It was surmounted on a statue of an elephant sculpted by Bernini for the purpose and was unveiled in 1667 in front of the church. Santa Maria sopra Minerva was built in 1280-1453 on the model of Santa Maria Novella in Florence. The facade was only completed in 1725. Baroque additions were removed during restoration in 1848-55 under the direction of Girolamo Bianchedi and the interior was decorated in neo-gothic. 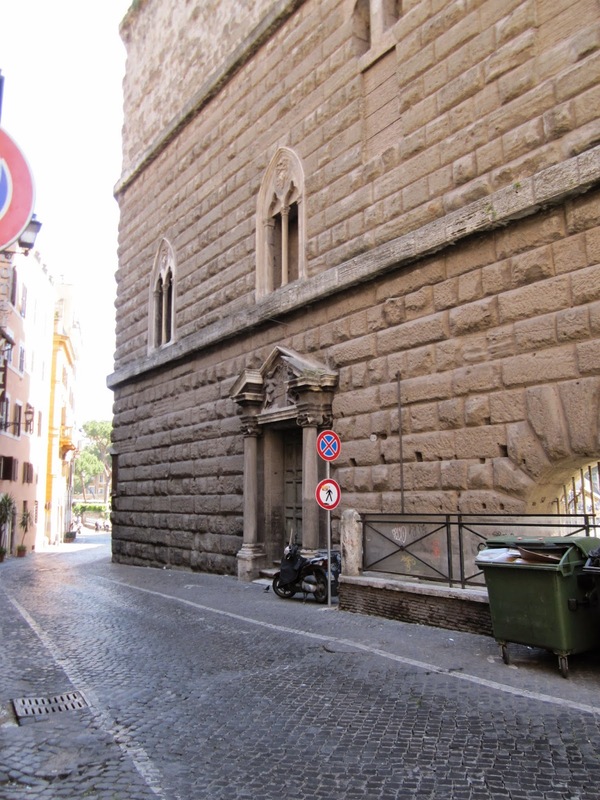 Opposite the church stands Palazzo Severoli, a building originating in the 14th century but entirely rebuilt in 1878. 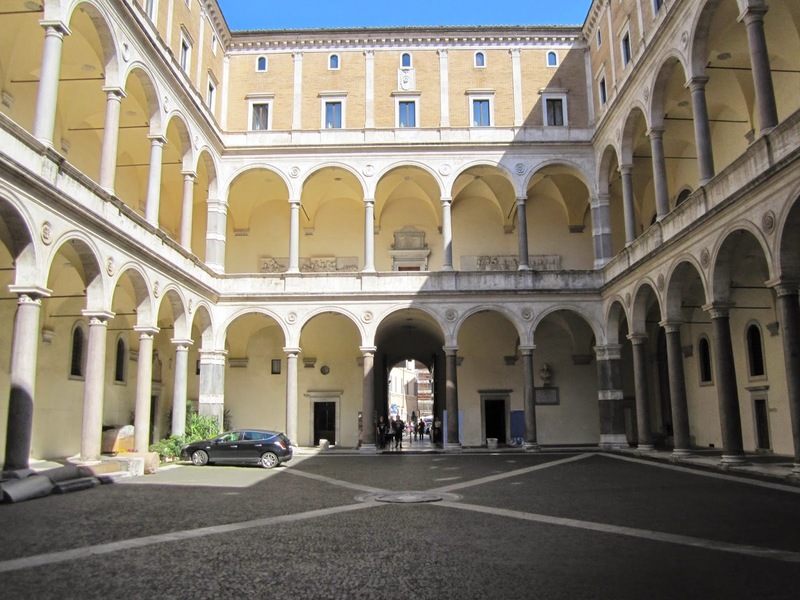 It houses an academy that trains priests to serve as diplomats for the Vatican state. Palazzo della Consulta was built in 1732-37 by the architect Ferdinando Fuga to house the secretariat of the Sacra Congregazione della Consulta, which was the main state council of the papal states. 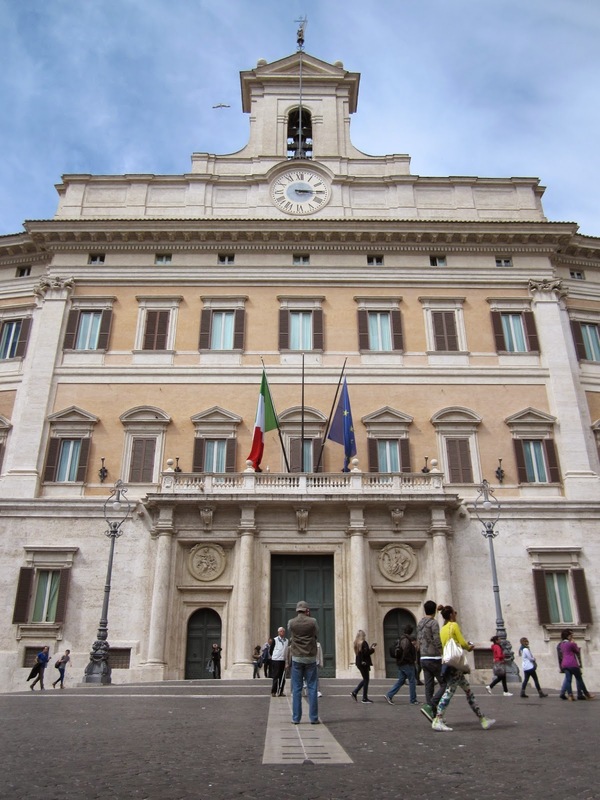 It has served many different uses in the intervening years and has been the seat of the Constitutional Court of Italy since 1955. It was commissioned under pope Clement XII. The statues on the fountain were placed on the Piazza del Quirinale in 1588, the obelisk followed in 1786, while the granite basin was added in 1818. The statues are Roman replicas of Greek originals and stood at the entrance to the baths of Constantine. The obelisk is Egyptian and was one of two obelisks at the entrance of the mausoleum of Augustus. The inner facade of Porta del Popolo was originally designed by Bernini for the occasion of the arrival of Queen Cristinia of Sweden in 1665. At this time, the gate only had a single arch flanked by square bastions. 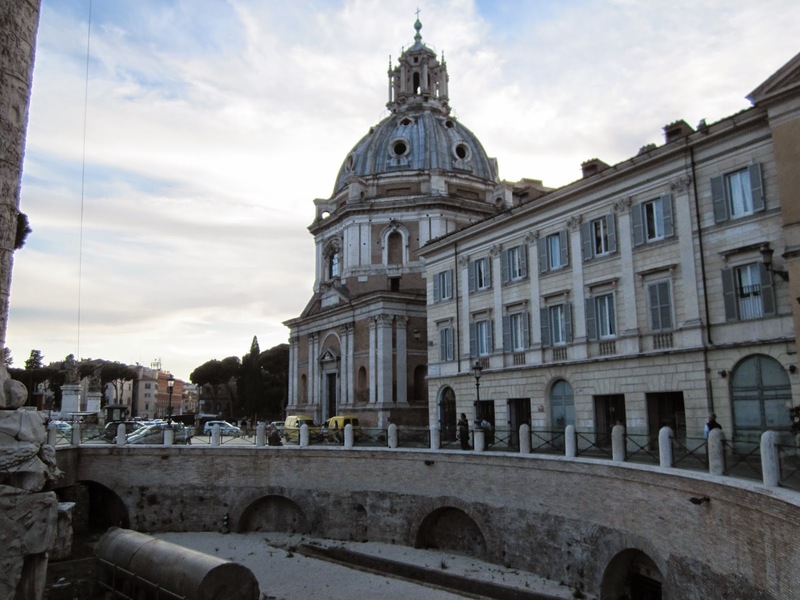 The bastions were demolished in 1879 and two lateral archways were created in 1887 to facilitate traffic and Bernini's design was modified accordingly. The same treatment was given to the outer facade, which had been created in 1562-65 by Nanni di Baccio Bigio with possible involvement from Michelangelo who had passed on the assignment due to his old age. The four columns flanking the central arch were taken from old St. Peter's. The gate is part of the city walls that were created in the late third century. The buildings on either side of the gate were designed by Giuseppe Valadier in 1811-22. 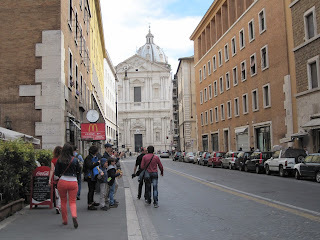 The police station on the left was given a dome to match the dome of the Cybo chapel of Santa Maria del Popolo while Valadier wrapped a building around the church to maintain symmetry. Valadier used the same design but without the section with domes on the opposite side of the square. 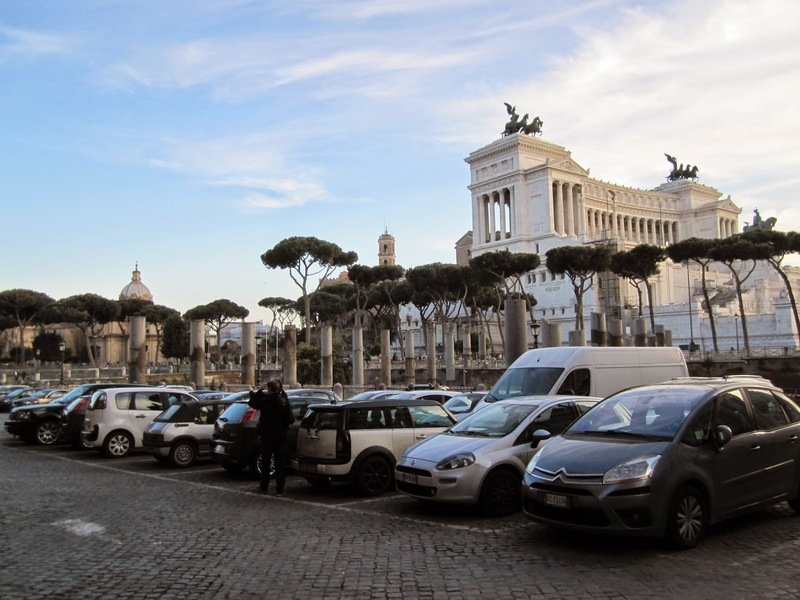 Corso Vittorio Emanuele II is a wide thoroughfare created by a resolution of 1886, connecting the Vatican to Piazza del Gesu, via Ponte Vittorio Emanuele II, which was designed in 1886 but only inaugurated in 1911. 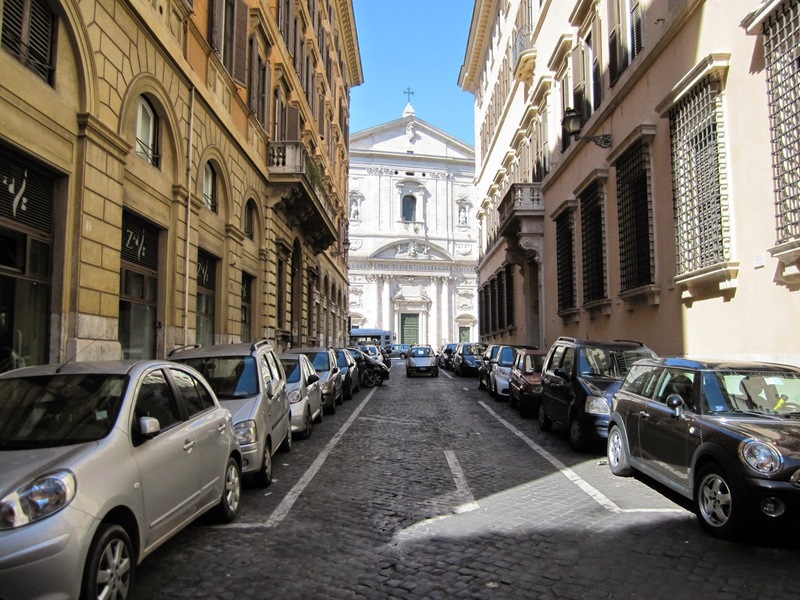 It largely follows the trace of the Via Papalis, the processional route used by the popes from the Vatican to the Lateran. Some of the buildings on the right survived the construction of the new street. 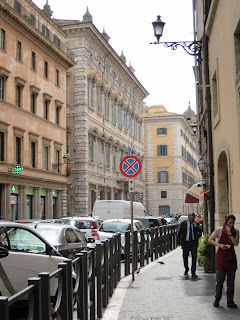 This includes the Collegio Calasanzio, built in 1746 by the architect Tomasso De Marchis, Palazzo Ruggeri, originally built by architect Giacomo della Porta in 1588 but redesigned in the early 17th century, and Palazzo Celsi Viscardi, built in 1678 by architect Giovanni Antonio de Rossi. The buildings on the opposite side of what was previously a much narrower road were pulled down and replaced with new buildings. One of the buildings that were demolished was called Palazzo Amadei. 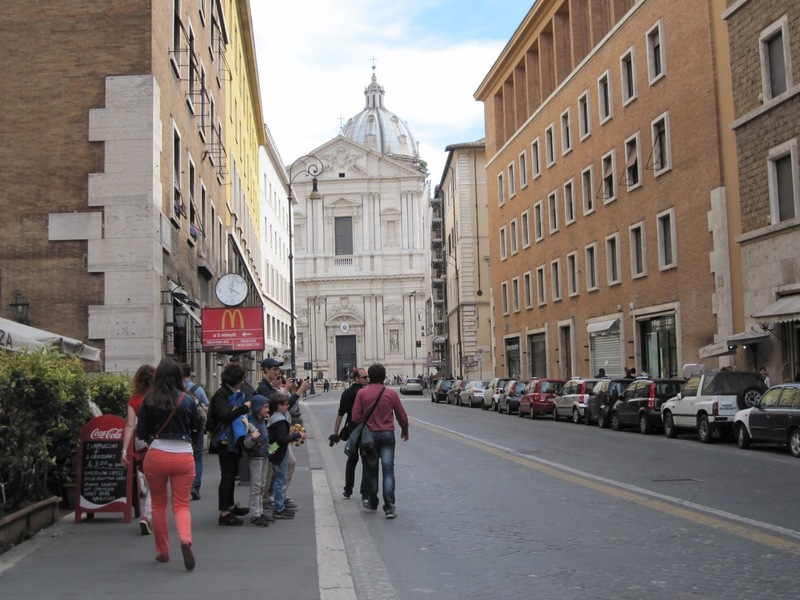 Via del Plebiscito continues on the left of the church to Piazza Venezia. The Altare della Patria or Vittorio Emanuele II monument was designed in 1885 by Giuseppe Saconni as a monument to the unification of Italy. The structure, which involved a collaborative effort by various sculptors, was inaugurated in 1911 for the international exhibition commemorating 50 years of Italian unification but it was only fully completed in 1925. A whole medieval neighbourhood was cleared to make way for the monument, including a Franciscan friary, Pope Paul III's tower and the arch of San Marco. Corso del Rinascimento was built in the 1930s and separates the districts of Parione and Sant' Eustachio. 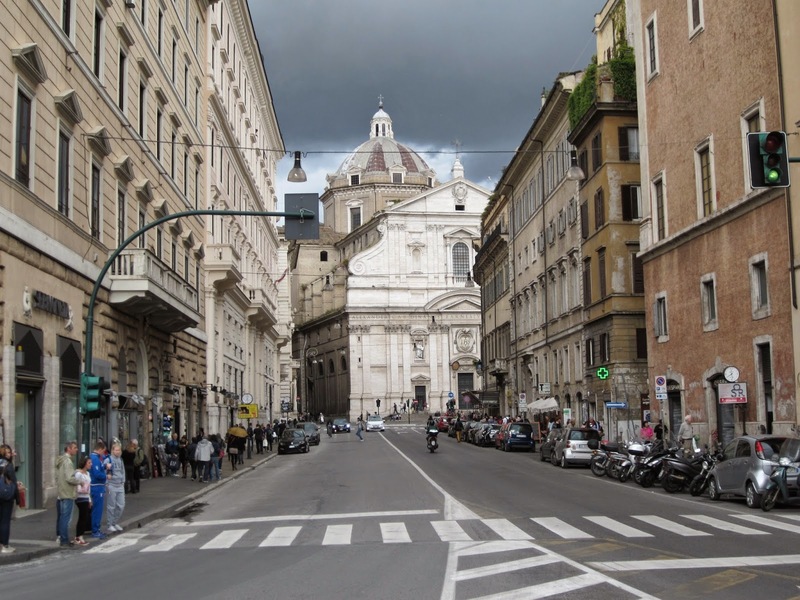 According to the plan of 1931, the street was intended to continue via Campo dei Fiori and past Palazzo Farnese and Spada to Ponte Sisto to link with Trastevere, but only the section between Piazza delle Cinque Lune and Piazza di Sant'Andrea della Valle was completed. 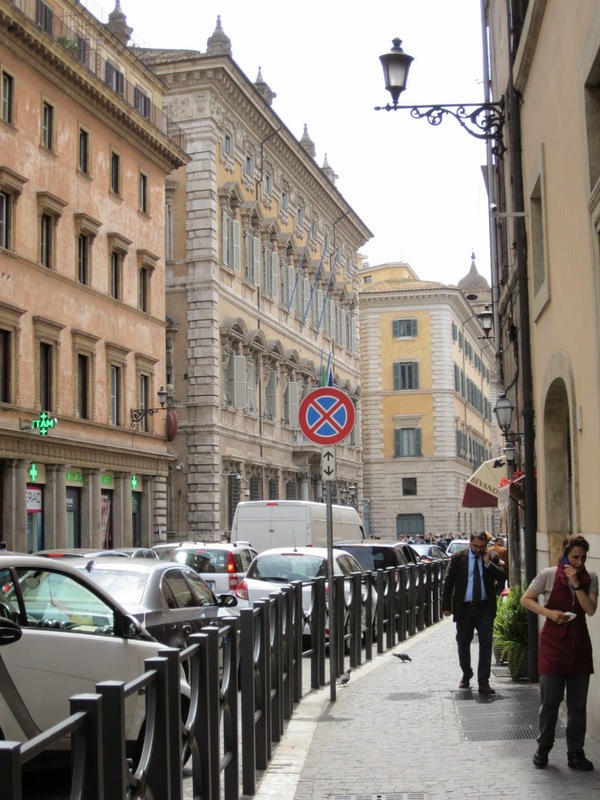 The work to remove the streets of Via del Pino, Pinacolo and della Sapienza began in 1936. Buildings from the 17th and 18th centuries were destroyed, some were reconstructed under the direction of architect Arnaldo Foschini and engineer Salvatore Rebecchini. The apse and transept of San Giacomo degli Spagnoli was demolished in 1938, the main entrance had been moved to Piazza Navona during a renovation in the 19th century, but this was reversed by Foschini and a loggia was added to the facade.